Flame patterns aren’t unusual on guitars. On pianos? Only from City Sounds. Pianos from last year’s program have yielded unusual artwork that will be sold by auction Sunday. City Sounds: The Des Moines Public Piano Project has announced its first “City Sounds Brunch,” hosted by Centro on Sunday, March 6, from 10 a.m. to 3 p.m. The event includes a silent auction on dozens of pieces from the 2015 pianos that have been transformed into decorative art. The project’s 2015 pianos were painted by local artists and distributed around town for people to play and enjoy during warm-weather months. 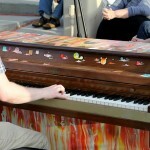 “Our board thought it would be a good idea to continue the life of these pianos through transforming them into pieces of art for the public to own, while creating a fundraising opportunity that contributes to the sustainability of the project,” explains Kathryn Dickel, chairwoman of the Public Piano Project board. 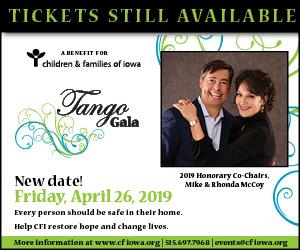 Jazz pianist Janey Hooper and Parranderos Latin Trio will perform throughout the event. Piano locations for 2016 will also be revealed. Reservations are recommended; the only cost is the normal menu price of whatever you choose to eat.